Welcome to the zodiac month of Pisces, and the Stargazing Pisces sale!!1! It’s been almost three months since Stargazing released and I would kindly thank anyone who bought it so far. I feel like this might now be a good time for a little experiment with the pricing so: as of today Stargazing is available at a greatly reduced price on the two major app stores (£0.69 or local equivalent) for the astrological month of Pisces (February 20-March 20). 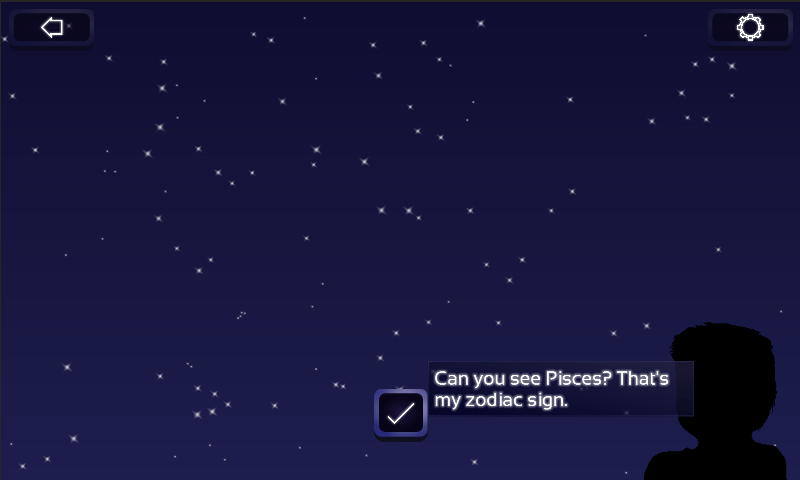 The constellation Pisces plays a small role in the game as seen above, so this satisfies my desire to give a narrative to everything. If you haven’t checked out the game yet: now might be a good time! It’s possible the price change hasn’t propagated to your particular part of an app store as of this post, but if not it should be there very shortly. Meanwhile, work continues apace on the space colony ship project I briefly wrote about last month. I intend to start putting out posts about that game very soon! This entry was posted in My Games, Stargazing by Paul. Bookmark the permalink.